He’s back! Pascal Dupuis announced he is in the line-up tonight against the Dallas Stars. It’s been 11 months since he played having been side lined by a clotting disorder and a knee injury. Just when it looked like he was ready to go for the season, he was hit with a mysterious injury unrelated to the clotting disorder. Don’t look for him to return to his former spot on the top line with Crosby. Coach Johnston plans to use Duper on different lines and to manage his minutes. If you have followed his story (and what Pens fan hasn’t?) you know he has been frustrated to be out of the game for so long. You also know that he has been more than a little intimidated by the clotting disorder that made him question his career in hockey. In February, Dupuis wrote a touching post for The Player’s Tribune titled simply, In My Blood. In the article detailed his injury and the discovery of a pulmonary embolism that could have easily been fatal. 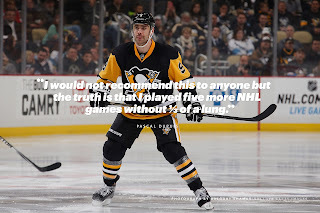 He also reveal that he played 5 games with only 1/3 of a lung functioning because he was “in denial”. 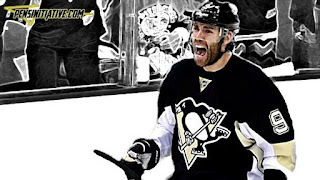 Since then, Dupuis has been very forthcoming with the details of his recovery and determination to return to the team. He authored another post for The Player’s Tribune in August titled, Why I’m Coming Back. In the second article he discussed with how he and his family have dealt with his health issues and his absence from hockey. He gives a poignant look at the dietary restrictions, how dangerous dehydration is for him and the daily Lovenox shots he gives himself to prevent another pulmonary embolism. "It’s pretty simple. You just have to be organized and stay on top of it, but compared to the monstrous whiteboard that my wife uses to tracks our four kids’ schedules, I really can’t complain. In fact, that’s why I wanted to put my story out there. I don’t want anybody to feel sorry for me or think that I’m playing with a handicap. When I’m out there on the ice, I’ll be 100 percent. I’ll be the same straight-line player. If you see me out there stick-handling and trying to be cute, there’s something a lot more wrong with me than my blood." 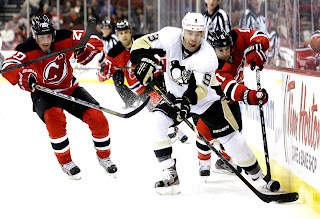 Tonight, when Dupuis takes the ice, think back to how hard he has battled for that moment. Realize that he is so important to the team that the organization found a way to keep him with the team even when he wasn’t permitted on the ice. Try to understand that, to him, playing meaningful hockey is everything. Then, try not to get caught up in the emotion of his return. Will he be the same player as he was 11 months ago? Not likely.....not at first anyway. He will, however be back on the ice and without a doubt, the happiest guy on the team no matter what line he’s on or how many minutes he plays. I hope the crowd erupts with applause for him. I can feel the tears welling in my eyes already.